Princess Cruises the brand is probably the one name even non-cruisers are able to name if you asked them for a cruise company. Most people 40+ of age will remember them from the popular American TV drama ‘Love Boat’ which was filmed onboard one of their ships. But Princess hasn’t just been on our TVs in the 1970s and 80s. Over the last two years, ITV here in the UK has aired two seasons of a reality TV show ‘The Cruise’ filmed on two of the newest ships. The TV show is just part of Princess’ recent UK expansion. During the summer season of 2016, Caribbean Princess was home-ported in Southampton. She sailed both Northern Europe and UK & Ireland round-trip itineraries during this UK residency. These must have been a success, as her UK home port sailings continue again this summer 2017. And as she joins our shores, she’ll have completed a multimillion refurbishment programme so she’ll have a fresh air about her. Caribbean Princess was launched back in 2004 and she was the largest of Princess’ ships up until 2013. Since then the newer sisters Royal and Regal Princess have surpassed her in size. But she still looks impressive, I discovered, as I joined a ship tour for local press and bloggers in Greenock, Scotland in July 2016. I could clearly see her towering presence in the harbour well before my train pulled into the cruise port of Greenock itself. This is no surprise, as Caribbean Princess has 19 decks (taller than most buildings in this port town) and is 592 feet long. That’s 290 meters, for us metric folk. Or to give a visual reference, almost three football fields in length. Docked in Greenock she looked spotless and well maintained. In fact, as I arrived at the pier the crew were out washing her with tall hydraulic units to ensure her gleaming appearance. Meanwhile, other crew onboard were washing her balconies. A thankless task, especially on a chilly and dreich Scottish day. The rain was off for just a few minutes to allow me to take this photo of her. I was the first of our small group of visitors to arrive and had some minutes to take in the opulent open-plan atrium ‘Piazza’. 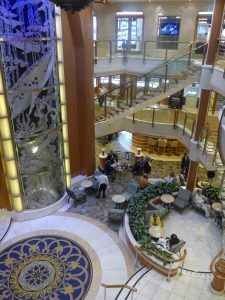 It spans three floors from deck 5 and above, and is surrounded by various shopping, eating & drinking venues. As you can see from the photos The Piazza is an airy space with a blue and purple stained glass effect roof. The shape is (currently) matched by blue and yellow circular mosaic-effect floor. The two panoramic lift shafts were dark glass reflecting blues and greens of the Caribbean sea with white ivory-like seascapes overlaid on them – fish and jellyfish, large predators and intricate seaweed. The curved glass panels were surrounded by cherry oak and brass bars. Beautiful detail, matched delicately with plain flooring, as not to distract from the artful display running the height of all three decks. On the bottom floor of the atrium space is where you find the International Cafe – a 24h coffee and light snack dining venue made to have a continental street café feel about it. It’s a great place for coffee and people watching – or to enjoy performances on the centre Piazza. It serves coffees, smoothies, sweets, savouries and salads round the clock. Surely a sight for sore eyes and saviour of a late night cruiser with an empty stomach. Especially after a few drinks when you need a little sustenance. The glass display units were full of beautifully decorated cakes and pastries (none of which were vegan, sadly). 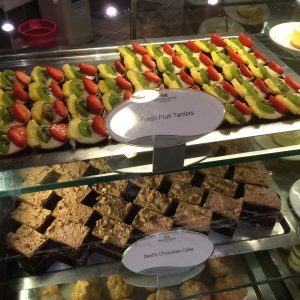 The vegan options available in the International Cafe consist mostly of salads that change daily. There was a savoury veggie panini that could made vegan by omitting the cheese. 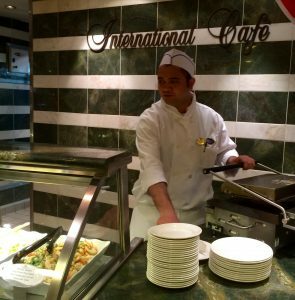 Most of the food served aboard, such as light meals in the International Cafe, is included in your cruise fare. Specialty coffees, however, incur a charge to your onboard account. Soy is the only plant milk is available on Princess. UK sister brand P&O can supply other plant milk alternative, but it has to be requested in advance. On Caribbean Princess there were not only Oreos (vegan) but a great range of other fine chocolates that no doubt would contain some dark (dairy-free) chocolate. The shop even sold some holiday paperbacks. It was closed during port hours so I couldn’t go inspect how many vegan-friendly chocolates there were on the shelves. Reading material shouldn’t be a problem as the Internet Café with several PC stations had a rather well-stocked library too (just right of the photo). Perhaps an indication of the general age of Princess Cruiser or indication of the ship’s age. 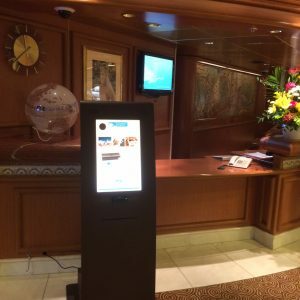 Cruisers these days are more likely to use e-readers for books and smartphones and tablets for internet use. 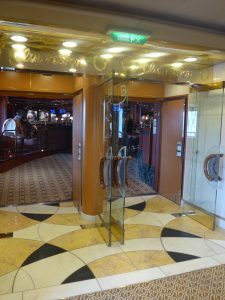 The plaza deck had also access to the main dining room but as doors were closed I couldn’t capture the interiors. Between the Art Gallery (thoroughfare to forward lifts & stairs) and the Chocolate Shop had another venue that perked my interest…called Vines. Vines, the bar, as the name suggests has an extensive wine list. Unfortunately, none of the wines on the menu were marked vegan or even vegetarian. In preparation for our August cruise on Royal Princess, I requested a copy of the list of wines Princess serves and received several pages on e-mail. Using Barnivore.com and contacting wineries directly I found a small selection of vegan-friendly wines. It would be hugely helpful if that information was already included in the menus. It would be especially helpful for those wine lovers with egg or fish allergies. The Vines, much like most of the ship was decked with red & white paper decorations as it was Canada day and the ship was marking the day with cake and decorations. Next deck up was the sleek guest services desk and shore excursions behind it. 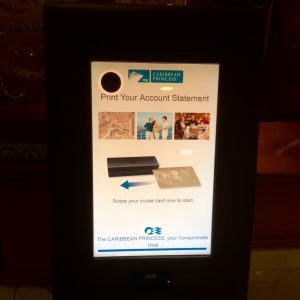 I was especially pleased to see the self-service stateroom account terminals. I had used them on my Carnival cruise to both check my account balance & make payments. They were extremely useful as guest services desk is often busy with enquiries needing more attention. These days there is even an easier way to keep track of your onboard spend – the Princess smartphone app Princess@Sea. You can use it to check your stateroom account balance, look for daily onboard activities or find port information using onboard WiFi. I am not often a fan of casinos on ships as they always seem cavelike. Many ships still allow smoking in the casino so that is deterrent to me as well. 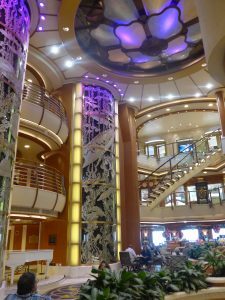 But I have to admit that I like the way the casino on Caribbean Princess was laid out, it did not seem too cramped and most importantly, it also had windows that let light in during the daytime. How refreshing! Our tour continued onto the Princess Theatre..spacious wide space on two levels. I had hoped to maybe catch a show practice but the venue was bright and empty as we entered it. From the theatre our group headed aft (to the rear) and we found ourselves in a traditional British pub. Or what Americans think it will be like. The Wheelhouse Bar is an olde-worlde dark wooden affair, in its subtlety more reminiscent of a private club than a modern UK pub. 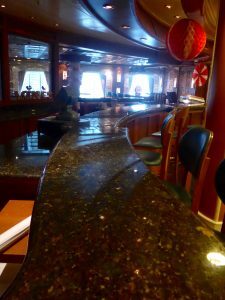 Once every sailing it serves the cruisers a popular British Pub lunch menu. On this particular UK & Ireland itinerary Guinness (still to be made vegan) had been added to the bar menu as a ‘guest drink’ – since the itinerary included Cork and Dublin. Right at the rear of the ship is the multi-function entertainment venue Club Fusion. Another dark-wooded affair, but with an American cousin feel, compared to the British pub next door. 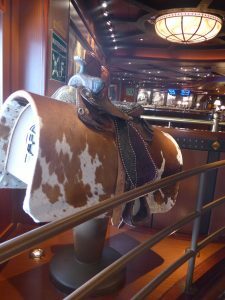 Club Fusion even had a bucking bronco at the door. Nice touch, I thought, except for the cow hide adorning it. Our next stop was the ship’s wedding chapel! This beautiful little room is found up on deck 16 (Sun Deck) where the captain can officiate weddings onboard. And fear not, even if the two of you have eloped or only a small number of friends or family are sailing with you, there is a webcam on the ceiling that allows friends and family view your special celebration from home – thank you, Internet! 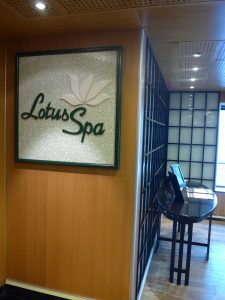 There is a large hair & beauty salon, gym with free weights and cardio equipment and another room for group fitness classes such as Zumba, yoga etc. 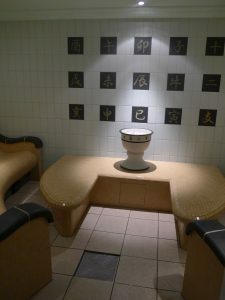 As expected, the Spa side has a number of massage/treatment rooms and there are saunas, steam rooms and specialty showers. Even heated tile loungers in the Thermal suite to enjoy. A pool courtyard is found the middle of this calm oasis.. great for the Mediterranean or Caribbean, not so much for Greenock weather. The one thing I wish I had a picture to share of is the onboard nightclub venue Skywalkers at the rear of the ship. I was distracted by its uniqueness so much that I forgot to take photos. If you look at the ship photo underneath, Skywalkers is a horizontal structure at the rear of the ship. It looks like a large beam balanced on two posts, suspended over the deck underneath it. That is the ship’s nightclub, perhaps with the best views of the sea there is – except for the bridge? I do prefer aft views myself, after all. Between the two posts at the rear of the ship, you can see another beam on an incline connecting to the middle of the Skywalkers structure. It is an airport-style glass and chrome tunnel with a view. So yes, I was impressed. At the end of our quick tour of the interior highlights, we were taken to a lunch in the Horizon Court buffet. Eating out somewhere unknown is always a daunting when you’re on a special diet. My fears were allayed as almost immediately I spotted an A4 sign on top of the buffet display advising those passengers with allergies to contact the sous chef on duty. It was good to see Princess acknowledge dietary requirements and to advise customers who to contact. None of the actual dishes (their menu cards) served had allergen notices on them like you have on main dining room menus. To be sure, your only safe option is to speak to staff. I was very pleasantly surprised by the lunch on offer. Not just the food but the staff that served us were friendly and full of banter. I was pleased to find a salad bar that didn’t have too many options ‘ruined’ with mayo or crumbly feta cheese – I had choices! Plus there was vinaigrette salad dressing available that was suitable for vegans, and not just creamy dressings. As expected, a selection of bread products to with the salad – the tomato focaccia I chose was soft and delicious. The line of hot dishes offered in the buffet included a vegan-friendly tomato & courgette pasta dish and an okra curry I served with chips. A busy plate, but I wanted to taste both. The food was hot, it was tasty and it was vegan! I believe the only suitable dessert was fresh fruit but after my full plate of savoury buffet options I was never going to have room for dessert. After lunch, our group explored the outside deck & pool areas as the rain had died down. I lost the count of pools and adjoining bars: they must be amazing areas on sunny climate journeys. I was especially impressed by the ‘Movies under the Stars’ outdoor cinema space at one of the pools where a number of comfortable padded loungers were positioned by a huge screen. Blankets, cushions and popcorn are handed out by staff at this unique venue when events are on: feature films, concerts and sports events. A drive-in of a kind, but better. With cocktails? It was a great honour to get access to the bridge and to stand where the captain and his officers control the ship. Our group received a friendly welcome and an informative presentation from a British officer onboard, who also took some questions from us. And gave us some time to take photos by which to remember the occasion. Our afternoon visit was soon over – and we only caught a small glimpse of what Caribbean Princess has to offer. 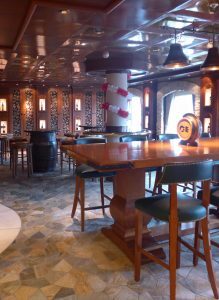 There are so many dining venues onboard including the main dining room, various specialty restaurants, poolside fast-food dining and numerous bars that we couldn’t possibly see everything. As the ship was sailing at full capacity there was no way to photograph cabins either. And as she returns to the UK in 2017, she’ll be looking very different no doubt. Oh, and one Caribbean Princess fact I must add for those who do remember the TV show Love Boat. Her christener was actress Jill Whelan – one who played Vicki Stubing (the captain’s daughter) on the TV show! Many thanks to Princess UK PR team for their hospitality and tour. ← Adriatic medieval gem for cat ladies – port of Kotor! Wow! I have never been on a cruise. You’re blog makes me want to book one asap. I’m a veggie and found it very difficult on holiday (spanish resort) as there were very little veggie options. I emailed the hotel about this and have been assured that they will invrease veggie meal options. I am looking forward to reading your future blogs re vegan cruising. 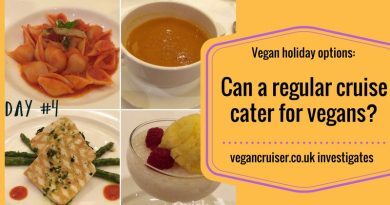 Being vegetarian on a cruise ship is easy, IMO. Options are plentiful. They cater for coeliacs (gluten free), dairy free, reduced sugar and cater for food allergies, even offer Kosher diet. 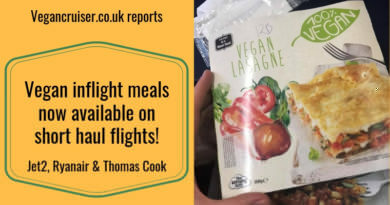 I haven’t come across any meat alternatives like Quorn or Linda McCartney items we get in the UK, but veggie food regardless. 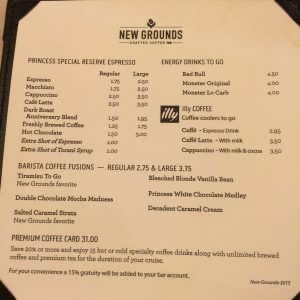 Princess apparently do a veggieburger so hope to try that in August, if it is egg & dairy free  Some Royal Caribbean ships do veggieburgers too, but not the ones we have sailed on.